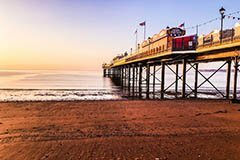 Paignton is a holiday destination for people who seek an English holiday resort for families with a choice of good quality safe beaches together with numerous other attractions. We offer a wide selection of coach holidays to Paignton from short coach breaks to lengthier tours that visit other areas of Devon and Cornwall. Paignton is an ideal base for the visitor who wants to visit the beautiful countryside and other areas of outstanding natural beauty that Devon may offer and in particular South Devon. Paignton offers a compressive selection of shops and amusements to suit most people’s choice and all within walking distance of the town centre, harbour and the beach. The centre, main beach and harbour areas are all on the level, which also attracts those individuals who find mobility difficult. Whenever you choose a coach holiday to Devon you are sure to see many sights and attractions on this amazing south-western county. If you cannot find a suitable coach holidays to Devon contact us and let our experienced travel agents help you find your perfect coach holiday to Devon or any other destination in England.